. ::[Lynx 3D Viewer DOWNLOAD Page]::. 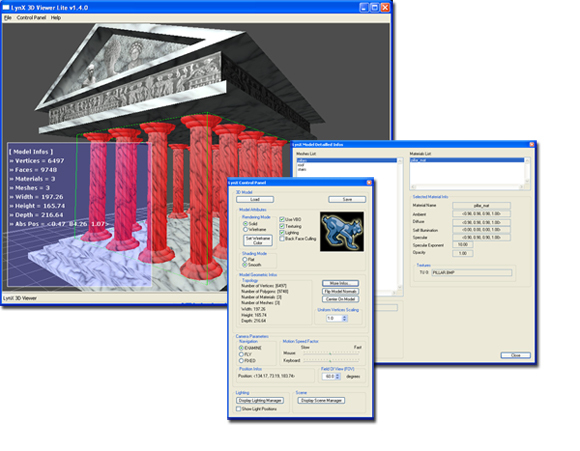 LynX Lite is the free version of the product LynX 3D Viewer Standard (soon available). 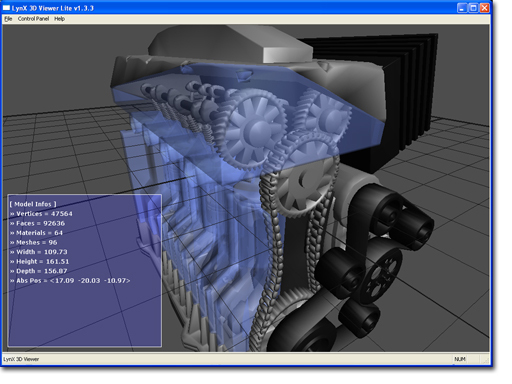 LynX Lite is a viewer that provides advanced 3D file format features. With LynX Lite, you can view and manipulate 3D models that have been designed with various modeling softwares, such as 3D Studio Max (*.3DS, *.ASE), Maya (*.OBJ) or MilkShape3D (*.TXT) for instance. Its real time 3D technology makes LynX a very useful tool for designers and any user interested in coping with 3D objets. More than a simple 3D viewer, LynX makes it possible to display and analyse complex polygonal meshes, to apply and easily modify lights, to highlight specific parts or important details of the object, as well as many other useful features. Built on the oZone3D engine, the LynX Lite exploits the latest 3D features of the latest graphic controllers such as VBO (Vertex Buffer Object) that allows fluid rendering even with high polycount models. LynX 3D Viewer is a precious tool when you have to deal with 3D models in a more sophisticated way than just visualizing model's appearance. With LynX 3D Viewer, you can find out what is the name of a sub-mesh, or check the properties of a material attached to the surface of any submesh. Here are the common questions we wonder when we have to use a 3D model into a real time 3D scene, as we often have to proceed in Hyperion Demo-System. Feature: auto-update of pan, wheel and keyboard speed according to model size. Removal: mouse and keyboard sliders to control motion speed. Change: update FreeImage plugin with the latest FreeImage 3.80 lib. Change: update LynX with the latest oZone3D 2.66 kernel. Bugfix: bug in oZone3D MilkShape3D loader when LynX tries to load an invalid file (like a readme.txt in place of a correct milkshape3D ascii file). Bugfix: bug when loading an ivalid model. Now the object alreday loaded remains inchanged. Feature: added inertia handling to EXAMINE camera. Feature: added automatic rescaling of object when they are too big (they are out of camera frustrum). Bugfix: bug in oZone3D o3mdl loading mesh function. The texture map file was not loaded correctly. Page generated in 0.0029449462890625 seconds.